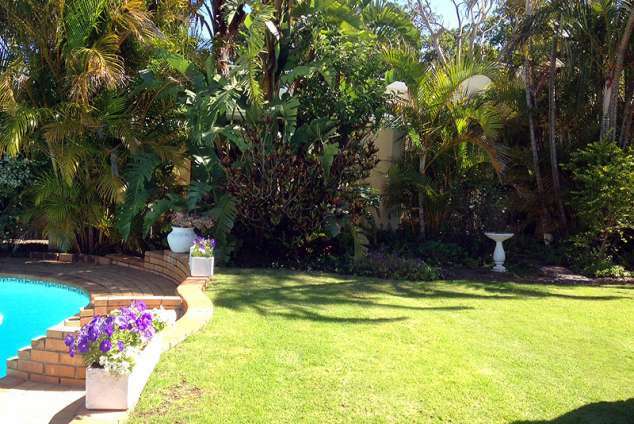 Bucks Guest Cottage - Berea, East London Accommodation. Bucks Guest Cottage consists of two self catering cottages situated in the peaceful suburb of Berea, East London. Each unit has its own private entrance and secure on site parking is available behind remote gates. This spacious cottage consists of one bedroom with two single beds, lounge with sleeper couch, open plan fully equipped kitchen with fridge/freezer, microwave, four plate stove, kettle and toaster. En-suite bathroom with bath, shower, toilet and hand basin. This cottage offers full DStv. This is a smaller open plan cottage with a queen size bed and a sleeper couch. Fully equipped modern kitchenette with bar fridge, microwave, two plate stove, kettle and toaster. The en-suite bathroom consists of a shower, toilet and hand basin. This cottage offers full DSTV. Bucks Guest Cottage is close to Vincent Park Shopping Centre and Hemmingways Casino. Within a radius of 2 km the following sporting facilities can be found: Joan Harrison Swimming and water polo pools, East London Golf Course, Kat Leisure Hockey Astro Turf and Selborne Tennis Courts. We are situated within 2 km from the renowned Nahoon Beach and all major schools in East London. We are a 15 minute drive to the airport and in close proximity to all local hospitals. Linen and bath towels are provided, sorry no beach towels. Baby camp cot is available on request and tea and coffee is provided on arrival. No smoking or pets are allowed inside the cottages and both units are fully alarmed for your peace of mind during your stay. Arrival time is from 14H00 and departure time is by 10H00. We regret we do not accept Credit Cards. 32679 page views since 06 Feb, 2007. Last updated on 30 Jan, 2019.